NGO CLUB OF GOOD VIBRATIONS in collaboration with several institutions that take care for children and youth with disabilities and 10 primary and secondary schools from four counties, in this school year, continues to implement project “NO LIMIT – Give 5 for a better world“. 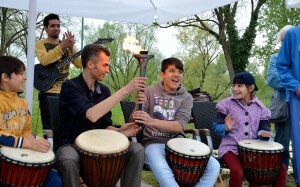 The main objectives of the project are to improve the health and quality of life of children and youth with disabilities, and to extend the awareness of the public, especially pupils and teachers in the school system about needs, abilities and rights of children and youth with disabilities to participate equally in the cultural and the public life of the community, and sensitivity for marginalized groups in society in general. Stated objectives we try to achieve through common therapeutic – inclusive drumming workshops and public performances of pupils of regular primary and secondary schools and their peers with disabilities. 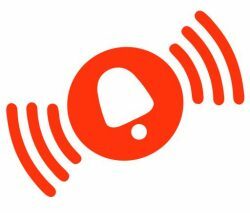 The project is implemented from 1 September 2015 – 30 Jun 2016. The partners from the beginning of the first semester are the Centers for Training and Education “Slava Raškaj” (ZG), “Zagreb” (ZG), “Tuškanac” (ZG) and “Šubićevac” (ŠI), Center for Rehabilitation “Stančić”, Croatian Red Cross, a huge number of organizations taking care of children and yoth with disabilities and 10 primary and secondary schools from the City of Zagreb, Zagreb county, Krapina-Zagorje county and the Šibenik-Knin county. In the second semester project is planed to be expanded on other parts of Republic of Croatia. In this school year we plan to implement a total of 315 workshops, 20 small and 6 large public performances with the direct participation of about 1100, and indirect of about 14.000 children and youth from our partner organizations. Also as part of the project plan and action called STARS DRUMS. As a part of STARS DRUMS we will host 10 workshops with least 10 celebrities, which will be documented in the form of short videos, photos and interviews of users and celebrities about their experience of participating in this project. Everything will be followed with the PR campaign during which will be regularly placed press releases, and videos will be distributed through YouTube and publication on the website of the project partners and social networks. The “NO LIMIT – Give 5 for a better world“ project has received a positive opinion from the Agency for Training and Education and has been approved by the Ministry of Science, Education and Sports. So far, following celebrities supported our project and confirmed their participation: Nina Badrić, Leon Lucev, Sandi Cenov, Goran Karan, Doris Pincic, Robert Kurbaša, Antonija Blace, Davor Dretar – Drele, Saša Lozar, Ecija Ojdanic, Ornela Vištica, Frano Domitrović, Blazenka Leib and current Miss of Croatia Maja Spahija. We started to implement this project in September 2013, in collaboration with the Center for Training and Education “Slava Raškaj” from Zagreb. 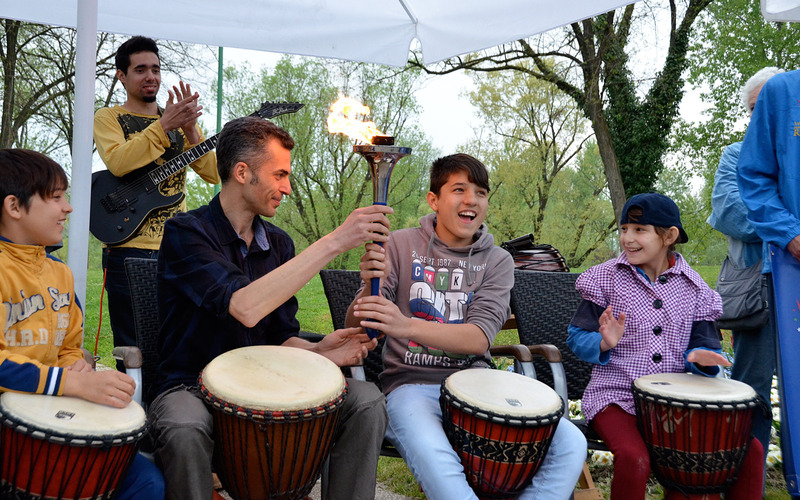 In consultation with management and professional team, we organized a therapeutic drumming workshops for children faced with hearing impairments and other multiple communication difficulties. 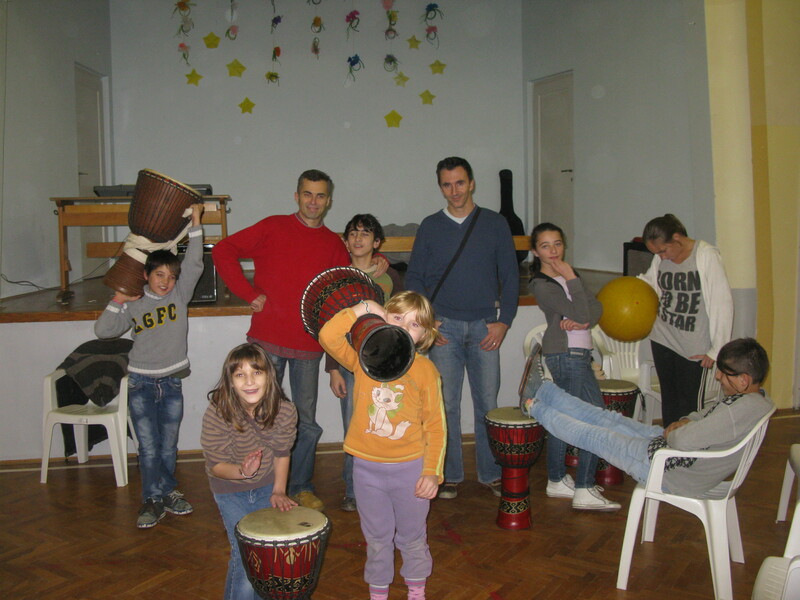 During the school year 2013/14, 20 children from Center “Slava Raškaj” participated in the 60 drumming workshops and did 10 public performances. Since September 2014, the elementary school “Jabukovac” joined us, and since then, students from this school participate in workshops together with children from Center “Slava Raškaj”. Thus in addition the workshops are not only rehabilitative, they are inclusive too. Children with hearing loss get the chance to meet and socialize with their peers in their neighborhood (children from “Slave Raškaj” are otherwise socially isolated because of the specificity of their way of communication – sign language, and 20 of them socialize almost exclusively with each other, without significant contact with the outside world). On the other hand, students from elementary school Jabukovac get the opportunity to develop a sense of community and a tendency towards volunteerism, and to cultivate their emotionality as one of the basic prerequisites for healthy growth. The crown of the work was our Christmas concert in the concert hall “Lisinski”, held on 18.12.2014. On that occasion the part of workshop participants, accompanied by Armed Forces Symphonic Wind Orchestra performed compositions “Little Drummer Boy” and “Radetzky March” to the delight of crowded halls. At the concert, as soloists, one of the performers were Marko Tolja and Hussar sisters, a hosted assembly “Izvor” and the choir “Sv. George “ the Navy. In the meantime we have been contacted from a large number of primary and secondary schools from all over the Croatian who are interested to be involved in this project. Since we are currently working on a plastic pole toys, for continuing and serious results, it is necessary to get a new, better quality drums, each of which costs around 2,250 kn. If you want to donate funds for the purchase of instruments, IBAN Association reads: HR3424840081106228477, Raiffeisenbank Austria dd Address of the association: “Mlinovi’ 102 / A, 10000, Zagreb. The account is multi-currency, and to it can pay local and foreign currency deposit.